I grew up knowing Miguel. That's how we call it - that's how we call San Miguel Beer. I knew someone close to us, who used to spend the night with Miguel; and growing up in this place in Manila where every night (and even day), always seems like a feast. I got a taste of SMB growing up. Who would ever escape the invitation of peer and a bottle of cold beer? But when I thought of San Miguel Beer, I always knew that it is the company I want to work for after College. But the irony, I never even tried applying. Anyway, Miguel or SMB is still part of my work life. Whenever there is a celebration or party to attend, everyone comes to SMB to lighten up the event. True to the characteristics of Filipinos, we love to celebrate and have fun - and now San Miguel Beer launches its new website which promotes tourism and the 7,107 beautiful things in the Philippines. When I heard of the 7,107 celebrations, I thought of the website founded by a blogger friend, Alvin Tan - http://7107reasons.com/. His site promotes Philippine Tourism, and he lists reasons why one should love the Philippines (do check it out and contribute!). Anyway, the launch was held in a really exotic restaurant, Adarna Restaurant in Kalayaan. I have been dying to visit the place so imagine my excitement when I step foot in the homey restaurant (never mind it was raining hard that night). The place is just perfect for the theme. We were served with (you got it! ), Filipino food and paired with your favorite San Miguel Beer - dinner was perfect! I just had one SMB Apple Flavor. I love that it is light and refreshing. Have you read about my blog about the SMB Apple and Lemon drinks here? During the event, San Miguel Beer team welcomed the bloggers and introduced the new site. The team also answered the questions. for minors who want to register to the site. What to expect from the new site? Who doesn't love events? In here you can check about the history and origins of various festivities, and take part in the event. You can easily find festivals and happenings you've been meaning to attend via the search feature. You can event give tips by leaving comments at the bottom of every article using Facebook comment box. You can discover Philippines' beautiful sights, interesting places, and wonderful destinations at the Things To Do section. You can check outdoor activities, cultural shows, recreational attractions and other spots. How cool is this feature?! 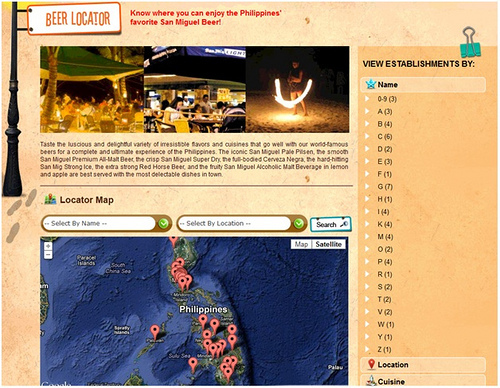 This gives you different places where SMB products are available and find establishments that offer a wide variety of delectable cuisines to satisfy diverse tastes and palates. This is powered by Google Maps technology and you can search by name, location or according to your preference of cuisine, ambiance or amenities. This is for registered users only. The section lists all ongoing promotions and offers from different outlets carrying SMB products. This is linked to the Facebook fanpage so readers can easily access the section. This section tackles just about anything related to travel and beer - from tips on how to keep the beer chilled to romantic destinations in the country. This is an amazing feature because it will allow you to create your own itinerary and the dates you're planning to go there. 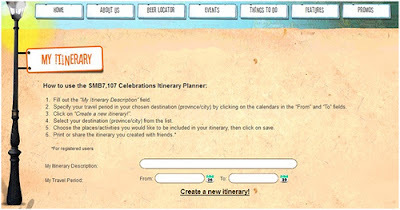 The itinerary can be printed and shared with travel buddies. This feature is only available to registered users. The event was like a celebration itself. There were games and surprises - and you got it, there was a beer drinking contest! The lucky winner got to take home Samsung Galaxy Pocket! the second runner up would take his place. LOL! To see more pictures, visit my Facebook Fanpage.